Embraer is on the verge of completing a deal with Portugal confirming the country as the first export customer for the KC-390 tanker transport. “We are discussing with the government the final contract,” the Brazilian airframer’s chief executive Paulo Cesar Silva said at a pre-Farnborough air show media briefing in Lisbon on 26 June. It seems that Sweden has postponed the upgrade of its old C-130H in favor of financing the purchase of the Patriot anti-aircraft system. Assuming that you finally come to a point when it is simply not worth to upgrade because of the plane's age, and if this is the case here I do not know, but our C-130 is quite old. The KC-390 has been mentioned as a replacement, especially since Brazil buys the Gripen. NZ is flying the first three C-130H off the production line, from 1965, and they will likely serve until they are at least 58 years old. The US is upgrading existing H models so there is certainly scope for more life. I imagine Sweden would have a similar or less intensive profile to NZ for their C-130 fleet. Edit: It appears that the bulk of Sweden's C-130H fleet was delivered in 1981, http://www.c-130.net/aircraft-database/ ... rce/SweAF/ so there should be plenty of scope for an upgrade of the current aircraft in a couple of years over replacement by a new aircraft such as the KC-390. All indications are that Sweden now won't look for a C-130H replacement until the early 2030s. There is a very positive understanding between Saab, Embraer and the Brazilian Air Force as result of the Grippen project. Therefore there is confidence that the KC-390 will be considered in replacing the Swedish C-130s. Many believe that Brazil will need a 2nd tranche of Grippen aircraft and this will open additional negotiations involving the KC-390 exports in exchange. Perhaps foolish of me but I consider Saab and the Swedish Air Force as two separate entities. The Swedish Air Force, which operates the C-130H, has clearly stated they aren’t looking for a replacement until the early 2030s. The Swedish Air Force has postponed plans to upgrade its Lockheed Martin C-130H Hercules fleet instead opting to do a mid-life upgrade for its six transport aircraft, an Air Force official said May 8. Col. Magnus Liljegren, head of the Air Force department at the Swedish armed forces headquarters, said it was probable that the work would consist of updates to aircraft’s avionics systems, not structural upgrades of the airframe itself. For that reason, the C-130s will fly only until the early 2030s. That may translate to a replacement order in the 2025-27 timeframe but still 7-10 years away at which point if the KC-390 is still in production would make it a likely candidate. Embraer achieved another important milestone today with the completion of the maiden flight of the first series production multi-mission medium airlift KC-390. As agreed with the Brazilian Air Force, the aircraft will now join the flight test campaign, in which more than 1,900 flight hours have already been logged. Civil certification of the basic aircraft will be granted by Brazilian aviation authority ANAC (Agência Nacional de Aviação Civil) and is expected to be achieved very soon." "The National Civil Aviation Agency (ANAC) reported today (October 19, 2018) that it issued the KC-390 certification. The issuance of the certificate allows the aircraft to be marketed and operated throughout Brazil." "The certification is issued by the agency when the aircraft design demonstrates that it has met all the operational, safety and environmental protection requirements." "The certification program of this model lasted seven years, with more than 2,500 requirements, and involved the participation of approximately 200 professionals accredited by the National Civil Aviation Agency (ANAC), as well as engineers and technicians from this entity." Well done. So when is EASA / FAA certification expected? Would an over the wing engine configuration, a la YC-14, be possible for this in a re-engined derivative? The Coanda effect seems like it could also help with rough fields (and config would ingest less debris), and perhaps the T-tail also would facilitate this modification? There are certain similarities in the designs, separated by about 40 years of technological changes. An easy way to compare complications between "engine configurations" is to look at An-72/74 family and their nearest relatives -- An-148/158/178 family. These planes are as similar as they could be, yet there are many differences, still. Brazil is expected to get their first aircraft in the second half of 2019. While it appears the KC-390 will have completed Embraer IOC/FOC qualifications by delivery the Brazilian Air Force will still have to go through this process and likely test the jet themselves. Embraer successfully completed a test of troop unloading and evacuation via the front and rear doors of its KC-390 at Brasília Air Force Base, in Brazil on 21 November. The tests are required for the aircraft to achieve Final Operational Capability, which is part of the final military certification of the aircraft, expected to occur in the last quarter of 2019, Embraer says. The KC-390 is a medium-sized military transport aircraft powered by two International Aero Engines V2500 turbofans. The transport can carry 80 passengers or 64 paratroopers. The aircraft received a type certification from the Brazilian aviation authority, Agência Nacional de Aviação Civil, in October. Embraer has said that the first production aircraft will be delivered to the Brazilian air force in the first half 2019. FlightGlobal’s Flight Fleets Analyzer shows that the service has 27 firm orders. The KC-390 is designed to perform missions such as cargo and troop transport, troop and cargo air delivery, aerial refueling, search and rescue and forest fire fighting. Embraer is attempting to push the aircraft into a military transport market dominated for decades by the Lockheed Martin C-130, by pitching what it claims is the lowest life-cycle cost in the market as well as top speeds that surpass its turboprop rival. There are 38 letters of intent to order the aircraft from international customers, including six LOIs from Argentina, six from Chile, 12 from Colombia, two from Czech Republic, six from Portugal, and six from Lisbon-based aviation services firm SkyTech, according to Flight Fleets Analyzer. The deal is official (although the Brazilian Government still has the final say). It will be interesting to see how this impacts future KC-390 exports including US production. I think this is the deal Embraer needed to give the KC-390 some credible support globally for military customers. Brazilian aerospace firm Embraer and Boeing have officially formed a joint venture on Embraer’s KC-390 multimission aircraft as part of a larger partnership on the companies’ commercial sides. Under the new agreement, Boeing and Embraer will work together to “promote and develop new markets” for the KC-390, according to a statement released early Monday. Embraer will own a 51 percent stake in the KC-390 joint venture, with Boeing owning the rest. The announcement on the KC-390 comes as the companies approved the terms of a strategic partnership that gives Boeing an 80 percent stake in Embraer’s commercial and services business for $4.2 billion. Before the parties move forward with the transaction, the government of Brazil — which holds a “golden share” in Embraer — must consent to the agreement, and the deal is also subject to the approval of shareholders and regulatory agencies. “Boeing and Embraer know each other well through more than two decades of collaboration, and the respect we have for each other and the value we see in this partnership has only increased since we announced our joint efforts earlier this year,” said Dennis Muilenburg, Boeing chairman, president and CEO. “We are confident that this partnership will deliver great value to Brazil and the Brazilian aerospace industry as a whole. This alliance will strengthen both companies in the global market and is aligned with our long-term sustainable growth strategy,” said Paulo Cesar de Souza e Silva, Embraer president and CEO. Boeing and Embraer have partnered on the KC-390 before. The companies agreed to pacts in 2012 and 2014 that gave the U.S. firm a role on global marketing and logistics support of the KC-390. However, in the wake of the commercial Boeing-Embraer deal, officials said a new KC-390 joint venture could be broader in scope than those partnerships. How this new joint venture differs from past agreements is unclear, and the news release contained only sparse details. According to a July 5 memorandum of understanding between the two companies, a KC-390 joint venture would “grow KC-390 sales and aftermarket opportunities through joint efforts in sales, marketing, engineering and industrial collaboration,” hinting that the partnership could involve an enhancement of the KC-390’s capabilities or Boeing’s help on technology and industrial development. In October, a Brazilian newspaper reported that Boeing and Embraer were discussing the prospect of building a KC-390 plant in the United States. I highly doubt Boeing can see the KC-390 entering service with the USAF as it is now. The KC-390 uses engines that are already a generation behind, accepting a fuel burn penalty for low risk/cost. It offers range equal to the old C-130J. Any future competition would see a C-130 offered using NP2000 8 blade props with engines that burn 10% less fuel while producing 10% more power. The current KC-390 would not stand a chance against that. I think it is highly likely Boeing is looking at a an engine upgrade. Thrust reversers that direct air up and forward like the C-17 is an absolute must for the USAF. Lower fuel burn would see range extended with any given payload. Pratts GTF or GE's LEAP engine would be mature and just need the complex thrust reversers added. The KC-390 airframe is brilliant. Agree, there is no point with the USAF force structure as it stands to go with the KC-390. I’m not sure how much of an impact the fuel burn would play compared to the impact of rough field operations with the engines. Fuel burn is a small part of the cost equation especially compared to operational utility and effectiveness. Fuel burn improvements gives many advantages. 10+% less fuel needed to fly the same distance means more payload can be carried over any given distance. Also takeoff distance grows exponentially with takeoff weight. To fly the same payload the same distance the KC-390 might takeoff 3-4T lighter thanks to the fuel burn improvements. Taking off at 71T instead of 75T might reduce the runway requirement by as much as 20%. All of this is vital to be a C-130J replacement. A heavy lift quad tilt rotor will most likely replace the C-130J in the short rough field role. Outposts will no longer require a small functioning runway. This is a massive advantage as the runway does not even have to be built, maintained or defended. The outpost could then be located in a superior easier to defend position. This gives massive cost savings and will be a game changer like the V-22. This helps justify the very high price. Now that the extreme short rough role is eliminated the KC-390 can comfortably replace the majority of the C-130J for cargo distribution. Its speed and low maintenance will make it the obvious choice. Boeing will no doubt see this. An improved KC-390 could also ease the burdon on C-17 fleet and the future heavy lift replacement. Interesting comments on how Embraer sees the relationship with Boeing on the KC-390. Clearly Boeing has more clout in the marketplace and being able to extract additional cost reduction via Boeing leverage will be a good thing for the aircraft. Embraer’s defence joint venture with Boeing will use the American company’s leverage over suppliers to cut parts and components costs on the KC-390 tactical transport. The Brazilian company said at an investor conference on 16 January that it will also lean on Boeing’s international sales and marketing network, as well as the USA’s geopolitical influence, to expand the transport’s sales. 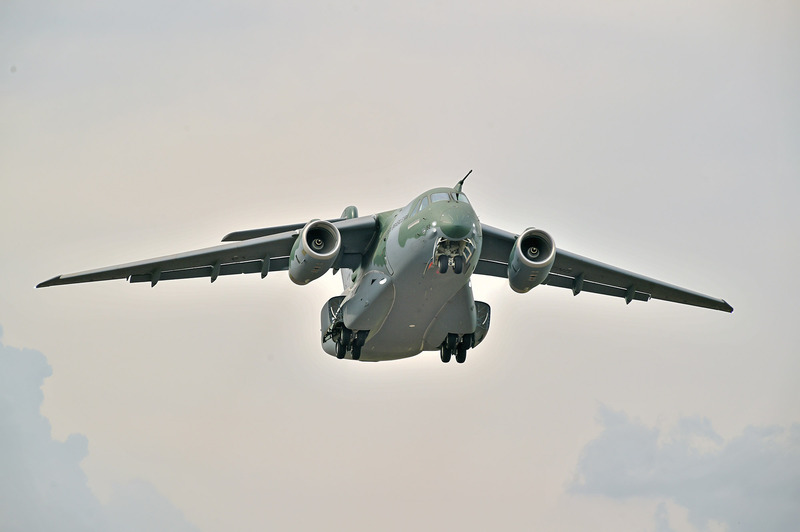 The KC-390 is powered by two International Aero Engines V2500 turbofans and can carry 80 passengers or 64 paratroopers. The aircraft is designed to perform missions such as cargo and troop transport, troop and cargo air delivery, aerial refueling, search and rescue and forest fire fighting. In order to launch the new defence joint venture, Embraer and Boeing will each contribute cash and assets, says Salgado. The defence-focused joint venture will also retain Embraer’s final assembly facilities in Melbourne, Florida, Gavião Peixoto, Brazil, and Jacksonville, Florida. Embraer says it is also researching adding a final assembly facility for the KC-390 in the USA. The KC-390 is aimed at the market segment filled by the Lockheed Martin C-130 Hercules, which holds the largest piece of the global military transport market in 2018 with 878 active aircraft, or a 21% market share, according to Flight Fleets Analyzer. Embraer claims the KC-390 has the lowest life-cycle cost in the market as well as top speeds that surpass its turboprop rival. Embraer plans to continue flight testing the transport in 2019 including advanced airdrop tests with heavy loads, aerial refueling and unpaved runway operations. The firm says that the first production aircraft will be delivered to the Brazilian Air Force in the first half of 2019. FlightGlobal’s Flight Fleets Analyzer shows that the service has 27 firm orders. Due to a runway excursion with prototype 001 in May 2018, the declaration of final operational capability for the aircraft is delayed until the second half of 2019, says the company. The incident caused the firm to incur a special item of $127 million, pushing down the company’s defense and security unit's 2018 revenue to $600 million from the forecasted $800 million to $900 million. Great to hear, thx Ozair. Investing in a US production line is another indication of the intent of the basic design. Boeing is surely eyeing an ability to bid low/safe design a la T/X. Interesting times. 2 add’l countries in talks/asking about KC390’s with Boeing/Embraer. “Right now, there are five that we’re talking to—pretty solid countries,” said Mark Bellew, director of sales and marketing for International Government Services at Boeing Global Services. The five countries extend beyond Embraer’s original teaming agreements with the governments of Argentina, Chile, Colombia, Czech Republic and Portugal. A Embraer aceitou a condição do governo português em pagar apenas 827 milhões de euros pela compra de cinco aeronaves de transporte militar KC-390, soube o Diário de Notícias junto de fontes do setor. Portugal and Embraer came to a agreement. 5 KC390 + 1 Flight Simulator + Lifetime Maintenance for 827mi euros.